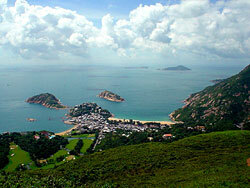 Sitting in the southeastern corner of Hong Kong Island, the 701-hectare Shek O Country Park was designated in 1979. From the north, it extends along the ridgeline that links Pottinger Peak with Mount Collinson, and crosses Wan Cham Shan and Shek O Peak (Dragon's Back) to reach D'Aguilar Peak in the south. There are three interconnecting hiking trails inside the park : Stage 7 of the Hong Kong Trail that leads from the Tai Tam Road catchment to To Tei Wan Village; Stage 8 of the Hong Kong Trail leading from Dragon's back to Big Wave Bay; and Pottinger Peak Country Trail that runs from Pottinger Gap to Cape Collinson Road. All three are scenic routes offering stunning vistas of Stanley, Tai Tam, Shek O and outlying islands, as well as the deep indent of Tai Tam Bay. Well loved by local residents and visitors, Shek O Country Park is a choice destination for morning walk and other outdoor activities. 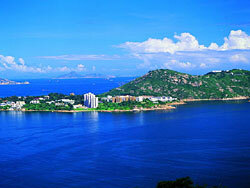 Shek O Country Park is Hong Kong Island's celebrated natural haven. The Dragon's Back, an undulating ridgetop trail between Wan Cham Shan and Shek O Peak, is the jewel of its crown. To experience this exhilarating route, follow Stage 8 of the Hong Kong Trail, which is the last and steepest section. Starting off in Shek O, follow the meandering streamside path. The ascent to Shek O Peak is quite strenuous, as the ridgetop path cuts through some treacherous terrain. As you gain height, a great sweep of turquoise water comes into view. This section of the trail is known as Dragon's Back, so named because it rolls up and down like the back ridge of the legendary beast. 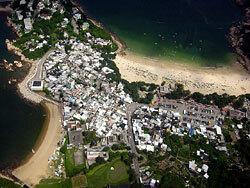 The vantage point offers splendid vistas across Shek O, Big Wave Bay and Tung Lung Chau in the distance. At this point, the trail makes its way through dense forests, passing gurgling hill streams along the way. Vistas of grand landscape soon give way to serene valley scenery. Just past Pottinger Gap, on your approach to Big Wave Bay, you look across the dynamic south coast of Hong Kong Island. The view is sublime and invigorating. Big Wave Bay marks the end of the Hong Kong Trail. Facilities in Shek O Country Park include barbecue and picnic areas. There are public toilets, rain shelters and barbecue stoves near the Big Wave Bay Picnic Area, Shek O Cape Picnic Area and Shek O Beach. Vegetation in these parts was severely damaged during WWII. Native shrubs and trees seen today are all hard-earned rewards of post-war reforestation programmes and stringent conservation measures. 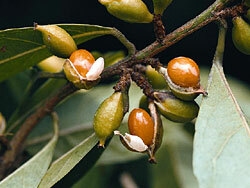 Key tree species are Hong Kong Gordonia (Polyspora axillaris), Machilus species, Ivy Tree (Schefflera heptaphylla), Aporusa (Aporusa dioica) and Rose Myrtle (Rhodomyrtus tomentosa). Rare plants like Buddhist Pine (Podocarpus macrophyllus) and Blue Japanese Oak (Cyclobalanopsis glauca) were also found here. Musk Shrew (Suncus murinus) and Chestnut Spiny Rat (Niviventer fulvescens) are occasionally seen in the local woodlands, while Chinese Ferret Badger (Melogale moschata), Masked Palm Civet (Paguma larvata) and Small Indian Civet (Viverricula indica) are common inhabitants. Sometimes you can find marks and trails of Chinese Porcupine (Hystrix brachyura), Chinese Leopard Cat (Prionailurus bengalensis) and Red Muntjac (Muntiacus muntjak). 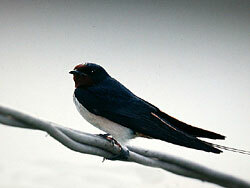 Apart from mammals, Shek O is also home of many birds. Common species are Common Buzzard (Buteo japonicus), White-bellied Sea Eagle (Haliaeetus leucogaster), Chinese Francolin (Francolinus pintadeanus), Barn Swallow (Hirundo rustica), Little Swift (Apus affinis), Blue Whistling Thrush (Myophonus caeruleus) and Black Drongo (Dicrurus macrocercus). Pottinger Peak Country Trail is a level catchment route that runs from Pottinger Gap to Cape Collinson Road. Shaded with trees, it gives delightful scenery. On your left and right are Pottinger Peak and Mount Collinson respectively. To the south of Mount Collinson, the rolling ridgelines of Wan Cham Shan and Shek O Peak strike a breathtaking presence the Dragon's Back. On the uplands, you gaze across dreamy landscapes and seascapes of Big Wave Bay and Shek O, and the ever enchanting Dragon's Back. Against a contrasting backdrop of urban Chaiwan and Siu Sai Wan, this pristine domain seems almost celestial. Just like Stage 8, Stage 7 of the Hong Kong Trail also lies within Shek O Country Park. Stage 7 is a relatively easy walk. Starting at Tai Tam Road, the trail skirts along the park border which next to the Shek O East catchwater. 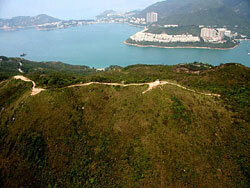 As it bends around Obelisk Hill, the wooded path gives a spectacular view of the Tai Tam Harbour. Further on, it passes through homely fishing villages Lan Nai Wan Village, Tung Ah Village, Tung Ah Pui Village and Ngan Hang Village until reaching its last stop at To Tei Wan Village. Here, a flight of steps lead up to Shek O Road. Looking back, you can see ravines sloping down to beryl waters of To Tei Wan, Tai Tam Bay and Stanley.